Japanese Knotweed is an extremely invasive shrub that was introduced in the early 1900’s as an edible/ornamental plant. It forms dense monocultures on stream banks, crowding out native vegetation. Knotweed can spread rapidly due to its ability to reproduce vegetatively. Root and stem fragments as small as 1/2″ can form new plant colonies. 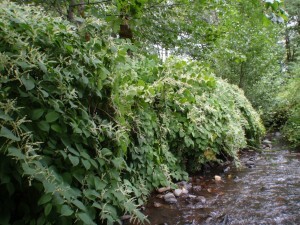 Seasonal high water events and floods sweep plants into rivers and creeks, then fragment and disperse knotweed parts throughout floodplains and cobble bars. The fast growing knotweed then takes advantage of the freshly disturbed soil to become established. Because it grows faster than most other plant species, it quickly outgrows and suppresses native plants. Knotweed dies back to the ground after a freeze, leaving stream banks bare of vegetation, which increases the potential for erosion. The Council began working with stream side landowners on Woods Creek in 2009 to locate and treat Japanese knotweed. Each year since, the amount of knotweed has decreased, but it continues to be present and require annual herbicide control. All of the landowners along five miles of Woods Creek have cooperated with the effort to treat the knotweed in hopes of one day successfully eradicating it from their stream. The Council first inventoried Japanese knotweed on Greasy Creek in 2010 during the Rapid BioAssessment survey. Treatments began the following year and have occurred each year since along 9.3 miles of main stem Greasy Creek and Wells, Cedar, Moss and Bounds creeks. Isolated patches of knotweed have been identified on Beaver Creek, Shotpouch Creek and TumTum River and are being treated. Additional patches are known to exist on upper Marys River in the Summit area, but the extent of the infestation is not known. It has not yet been surveyed or treated by the Council. Knotweed control in the Marys River Watershed has been supported by Coast Range Stewardship Fund, Meyer Memorial Trust and Freshwater Trust.